Today we are going to color the "Flower Bunny" stamp that I illustrated for Clear Dollar Stamps. This image is adorable in grey, white, even pale blue and pink for babies, but today we are doing him in brown. The color placement is the same for whatever color you choose to use. You will need the "Flower Bunny" stamp, watercolor paper, waterproof ink, a water pen or fine tip paint brush, and Tombow markers. I used 977, N95, 723, 098, and 062. Stamp your image and let dry a couple of minutes. With the 977 Brown, lay color down in the shaded areas of the bunny's head and body. With your dampened brush, pull the color out from dark to light making sure to leave the shaded areas darker. Avoid the chest, feet, and muzzle. Feather the color around the chest and feet, leaving these areas white. With the N95 Grey, color the shaded areas of the the tail, muzzle, and feet. This color is so light that there is really no need to follow with water blending. With the 723 Pink, add a touch of color to the ears, nose, and around the flower centers. Blend the color from dark to light with your brush. With the 098 Green, color in the shaded areas of the leaves, stems, and grass. Again, blend with the dampened brush. Fade the grass to white towards the bottom. Here is my finished project! Please say a prayer for our Katie today! CDS STAMPS USED: "Flower Bunny"
Happy Tuesday friends! Its Katie here to welcome you to a fun little technique known as Second Generation stamping. I'm sure that for many of you this might be a technique that you've heard of and forgotten about or I also hope for many of you this is a new technique and will show you a way to maximize the use of your Clear Dollar Stamps. There are several reasons why I love to use this technique. First of all, it really does maximize the look of your images. I tend to use this technique with more solid types of images though. Secondly, you really get every ounce of your ink usage! Thirdly, this is a great way to create depth and dimension and yet keep things flat. And lastly, its easy, easy, easy and fun to boot. Stamp your image just like normal. Now its just time to get your card together. I played with some of the new Clearly Coordinating Collection of Cardstock and Ribbon for my card today. My card front features Marrakech Basic Grey paper, Tangelo Smoothie Cardstock, Still Waters Cardstock, and Still Waters Satin Ribbon. Add image and sentiment and voila, finished card! I kept the shadow look with the use of the same Spellbinders Labels Nine Nestabilty. I wanted to share some other looks with several other stamp sets that are available at Clear Dollar Stamps. This first stamped background features a newer set called Plumes and Blooms. If you aren't aware yet, I love to create my own backgrounds and I love this look with this set. Remember, you can stamp your 1st image on scratch paper and then stamp your 2nd time on your project to get that softer look. Bitty Botanicals... a perfect fit for this technique. And finally, how about 3rd and 4th generation stamping? This works best for your darkest inks. This sample uses the just released set called Martial Arts. Darker inks will create more "generations"
"Huffing" can help between your stamped "generations"...what and why you ask? "Huffing" is just breathing onto your inked image. Your breath adds extra moisture to the ink since there is less of it. Don't spit though (hehe)... FYI... I did no huffing for any of these images. If you know or think of any more... share with us please. Thanks for hanging with us today and I hope you have a wonderful Tuesday. Make sure to come back this Friday for another Clearly Inspired Challenge! Hi friends! Its Katie here today to welcome you to another glorious week and another happy Tuesday. I hope you had a great weekend. With today's post, I wanted to go over something that is very basic to the cardmaker which is the card itself. What size do I make my cards? Can I mail them? How much does it cost? Do I cut my own? Do I buy pre-cut? Well basically, the answer is you can make your card sizes whatever you want, but there are some limitations and I'll tell you why in a moment. If you buy cards at your stationary store or at the craft stores then you are set because all the work is done for you, but if you want to cut your own then I've got some basics to share with you. Generally, the easiest and quickest with no waste comes from your standard piece of 8 1/2" x 11" piece of cardstock. There are a couple of ways to cut and fold the cardstock depending on how you want your card to look. The cards that you get from this size cardstock are known as A2 sized cards and envelopes for this size card are easy to find at your craft store or stationary store. These are also known as 5 Bar. envelopes as well. I've labeled the cards with a common way of describing the layout of the card. Now, if you cut in basically the opposite way from the above picture this is what you'll get (below), but same size cards and same size envelopes will result. You can also start with a 12 x12 piece of cardstock for the least amount of waste as well. But, your envelopes can be a bit harder to find and you might have to go online to do so. But are still out there. These are some of the basic sizes and since I had all these cards cut I thought I would share what they looked like if they were stamped on. Even though the sizes vary, they are all so easy to stamp with just one stamp set. I decided to use one of my favorite called Soil of Prayer. This set is perfect because it has a variety images in a variety of sizes. Here are the set of cards I created using this very stamp set. As you can see it doesn't really matter the size of the cards, you can still get a great design all of of them. I went with fall type colors since it definitely feels like fall in Washington State. If you are interested in some basics about Random Stamping or creating your own stamped backgrounds click HERE. I also wanted to add a little bit of tidbit information about mailing your cards. I read questions all the time about thicknesses, weight, and size concerning the cards that we want to mail through the USPS. I got this great sturdy plastic tool at my local post office. I try to do as much mailing as I possibly can from home so this is a great tool. Plus I have my own scale at home too. If you don't have a postal scale you can use a cooking scale as well and then I put in my information right on the USPS website. See that slot in the middle right? If you envelope fits through there then you are good and won't need to pay for a surcharge, unless your card is over the 1 oz weight. Plus this neat little tool has all the dimensions that you need for the sizes of cards that you can mail and what will need surcharges. I was sent something in the mail from a post office from across the country and it was clear that the postage had been figured out by machine at the post office. Well, my postman was kind enough to pay for the extra charge that apparently the post office from afar had somehow miscalculated. It is important to note though that all square envelopes always require an extra charge. I touched on some basics, but there are other sizes of cards and envelopes that are out there ready for purchase and of course you can really make whatever size you'd like. Thanks for coming to visit and spending some time with us. I hope you have a fabulous Tuesday! This is Katie signing off for Clearly iStamp. Hi Everyone! Its Katie here welcoming you to another Friday, which means we are coming upon another weekend which could be a yay or nay. I worked many years on weekends and they were just like any other day to me so I completely get you guys that are doing the time. So, the point of today's post is to share with you 4 very different cards that all feature this very set. I tried to make them different and they are, but I must admit I was in a pretty clean and simple mode when creating these so bear with me. As you can see there are some lovely flourishes in this set along with several sentiments and little flowers to go along. Seriously, lots of versatility going on here. My first card features the very largest flourish stamp in the set and I chose to create a non traditional color holiday card. There are no layers to this card (gasping, I know) and I chose to add the Basic Grey Bling It to give it some pizazz. My thinking was to use the rhinestones as little "holly" bits. Imagine this same card in a deep green ink with bright red pearls or rhinestones... love that idea, unfortunately for me I just had pink and green which I still likey :) I finished off this card with a little Merry Christmas sentiment that can purchased independently. My next card was created because I had seen several of these little birds created from buttons out on blog land and when I saw this one flourish in the set, I immediately thought "plumes" and bird plumes at that. My buttons are from my general stash at home and then I created the accessory parts of my bird with some plain old markers that I had lying around. Here's a little quick how to. I first decided on some super cute paper from the Mini Deck 6x6 pads by Cosmo Cricket. This particular one is called Early Bird. I then grabbed coordinating buttons and placed them where I thought they would work best on my cardstock. I then stamped my single flourish 3 times to create the tail feathers. After the flourish was stamped, I put my buttons back on with glue dots and then grabbed my pens and drew in a beak and the legs. Then I used a sharpie to create the eye. For my next card, I created a sympathy card using Versamark ink and silver embossing powder. Again, I kept this super clean and simple. I used another flourish image that to me looked like brackets and I paired it with another Clear Dollar set called Words of Sympathy. Using Versamark and embossing powder makes such a statement and I just love, love how it looks. And finally, one last card. I again paired it with the Cosmo Cricket, but this time grabbed the Jolly by Golly, which is really a holiday paper, but as you can see I didn't' create a holiday card. I created a fun and bright card instead. For this card, I didn't use any of the flourishes, but rather several of the accessory images - the 2 flowers and a straight dotted line that I used as a stem. Well, that's it for me and if you don't have this set, click away as fast as you can to grab it up. If you do have this set, I hope I have sparked some new ideas for you. Please feel free to comment and leave links to your own work... we'd love to see what you've created!! Thanks again for stopping and spending your time here at Clearly iStamp. Katie signing off for Clearly iStamp. How Random is Random Stamping? Good morning everyone! I hope you had a very merry Christmas or holiday! We have one more to get through and wowza - its going to be January 2009. I am truly amazed at how quickly time passes - children and age don't seem to slow it down that's for sure. Anyway, lets get started on today's tutorial. Are you a random stamping queen or king or do you shy away because you just aren't sure how to go about it? I'm going to put on my best Mom voice and say this, "Practice makes Perfect". Well maybe not perfect, but definitely more enjoyable and less stressful. I'm going to start by showing you my end result first and then laying out some guidelines for you to follow to get you going on the path of creating your own Designer Paper. Note: The stamp set I used is the August 2008 Stamp of the Month and is available right now for a mere $4.99. Most of, soon to be last year's Stamp of the Month sets are now available for purchase. Let me say here that I love stamping my own background. I think for one, it allows me to use a lot of my stamps which in all honestly makes me feel better. Secondly, I enjoy being able to customize my stamps to any color scheme that I want. My ingredient list is very basic so I don't have a picture, but all you need are your stamps, your ink, and your choice of paper. Remember to consider creating your own scrapbook paper backgrounds too! This is not just a card makers technique. Here are some Basic Guidelines to remember when you are creating your own Designer Paper. Ok, now for the pictures of how I created the above paper. Since I make a lot of cards, what I often do is cut my cardstock down to the standard A2 size (4 1/4" x 5 1/2") I do this so that after I'm done creating my design, my sheet is large enough to trim to whatever size I need. If you intend to use a different sized card then you would start with a coordinating size. So, its pretty simple. Take your stamp of choice and stamp! I like to start towards the middle, but not dead center - remember its RANDOM. Then pick the stamp up again and stamp another image. Remember to leave yourself enough space between the two images if you plan on using other stamps to fill in. Pick up and stamp once again. As you can see you have 3 stamped images on your paper. This is where the "randomness" isn't necessarily so random. Take a look at the second picture. This is THE MOST important concept in random stamping. TRIANGLES. Your images don't have to form a perfect equilateral triangle every time, but rather follow a 3 point concept. So here we again. So in the left picture, you can see how I formed another triangle (the dashed lines). In the next photo I added one more for another triangle (dashes and dots). Then I just continued to build onto the main images until there is no more room. Now its time to stamp your second image. General rule of thumb here is to stamp your 2nd image inside those imaginary triangles that you created with your 1st stamp. This is also where it starts get murky because since your triangles aren't necessarily the exact same size you will have to use your own judgment as to how full you want your paper to look. Now its time to add a 3rd image. Same concept as before except now you can add that your goal is to basically fill in the empty spaces. The last picture is my finished designer paper. Creating your own designer paper is super easy and for me if almost therapeutic. I love the calmness of the repetition of motion - ink to paper, ink to paper, ink to paper, etc. I also like the fact that you don't have to be perfect or exact in your stamping. And the guidelines that I listed above are just that. They are just general rules of thumb to help you get started in creating your own paper. The other key here is to just let loose and have fun. It's ok if some images overlap others or not, it's ok if you use 1,2,3,4, or 5 images, it's ok if you use as little or as many inks, it's ok if you like tightly packed images or widely spaced images. The only thing that really matters is that you like what you see. And finally, remember to do it! The more you practice the better your eye will be and the more fun you will have doing it. This is a basic stepping stone for creating your own designer paper. There are lots of additional techniques out there to change and/or enhance your stamping for limitless results. Now, I've got some more examples of some spare sheets that I created. I will set these aside and they will be ready to go next time I want to make a card, either with that color scheme or stamp image. I chose to just use one image and color them in with Copics for my cheese background. Again, I only used 1 image and used colored cardstock. Another difference with this piece is that its very sequenced. I stamped my image in a row and then just shifted the above and below images slightly. And my last piece uses just 2 stamps and guess what? I ended up stamping my smaller image which in this case was a sentiment first and then over stamped with my larger snowflake stamp. See it all works. So, I've shared what I know and I hope it helps you consider creating your own designer paper. Clear Dollar Stamps are wonderful for this technique. For those of you who are old hands at this, we'd love it if you shared any additional tips/tricks to "random" stamping. Thank you so much for stopping by and visiting and I wish every one of you a very happy day. What are the ins and outs of being Clearly inspired? Hi Everyone! I want to introduce myself since I am not Lori. My name is Katie and I am lucky enough to be one of a fabulous group of Design Team Members for Clear Dollar Stamps. 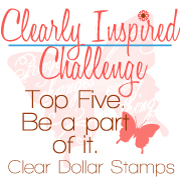 She has graciously asked me to help with the Clear Dollar Stamps blog aka Clearly iStamp. I will be contributing to Lori's wonderful blog here and there and I can only hope I do it and her justice. Today, I want to focus on you, the stamper that maybe be new or curious about the world of Clear Stamps. I want to share some pictures of exactly what you get and what you should do with your Clear Dollar Stamps when you receive them. The stamp set that I will be focusing on today is the FREE set with any $50 purchase at CDStamps for the rest of this month. Next month will be another great set - trust me I've seen it and its 33% larger than the past sets, but don't miss out on this month's set. It's so cute and would work perfectly for your holiday cards. Here is a picture of the way you will receive your free set or any larger set from CD Stamps. You will receive a printed version of what the stamp set looks like, a cling sheet with your clear stamps on it, all enclosed in a zip lock bag. This next picture contains everything that you will need to make a custom holiday card handmade by you! The first thing you want to do is remove those beautiful stamps and peel away the thin protective plastic covering the stamps. I personally don't keep that and just chuck it. Next, all you need to do is gently peel your choice of stamp right off the plastic. When you first peel a brand new stamp from the plastic its best to gently bend the plastic sheet and again gently peel the stamp upward. The next step is to grab your acrylic block and place your stamped image right on it. It will stick to the surface like magic. You can find any size you need at Clear Dollar. If you are on a budget, try to find a size that will accommodate several size stamps, but for ease of stamping you will want to eventually get a variety of sizes. If your block is too large for your image it is more difficult to create the right pressure for a perfectly stamped image. Some questions that tend to surface have to do with a solid stamped image. All clear stamps (at least with all the brands that I have personally purchased need to be "conditioned" before stamping that perfect image on your work. Conditioning just means that you are getting your clear stamps ready to stamp nice crisp images. The way I generally condition my stamps is to literally just stamp several times on scratch paper. This has worked for me with all my Clear Dollar Stamps. The lesser quality clear stamps definitely need more conditioning which might even mean getting your sanding paper out. But no worries, not with Clear Dollar! Another way to "condition" your clear stamps is to run an eraser across your stamps before stamping. In my case, I use the eraser on the end of my mechanical pencil. I only use the white eraser because they seem less gritty in my opinion. You can purchase large white block erasers at your office supply store or you can find white erasers in the pencil form which just means that they are the same shape as the one in my mechanical pencil, but with no pencil part. All you do is gently run the eraser over the stamp and then gently wipe away any excess eraser either with a baby wipe or on your stamp scrubber. What you are doing is literally "dirtying" or "roughening" your stamp surface so ink will "stick" better to the stamp. Now you are ready to stamp. Many of the stamp sets are perfect for coloring in with markers, colored pencils, or watercolor pencils, but as I stated above, I want to focus on the beginner stamper so I've chosen some colored cardstock and ink instead. I chose brown ink for my stamp and stamped it on brown cardstock. My piece of brown cardstock is exactly 2"x2". The wonderful component of clear stamps is that you are able to see exactly where you are stamping. Another item I would like to mention that may help with achieving a nice clean crisp image is something you probably have lying around your house which means its free. It is the foam layer that you are seeing under my cardstock. It often comes in packaging and if you've been good and not purchased anything recently, head on over to your local grocery store to the floral department and they just might have some extra foam for you. So your question - why? Well, if you noticed, wood mounted stamps come with cushion attached to the wood, but clear stamps do not. The foam acts as that cushion when necessary. The extra foam is something that I like to have on hand, but isn't something that I use all the time. It just depends on the stamp and the surface I'm working on. In the case of this card, since it is pretty simple I decided to stamp my own background with one of the stamps in this set. Again, due to the "clear" factor I was able to see my spacing and exactly where to put the snow on my card. Next I adhered my stamped mailbox onto my card and got ready for the finishing touch - the sentiment. Sentiments have got to be the hardest stamps to keep straight and aligned on your card. Again, the "clear" factor comes in. Just ink up, see the placement, and stamp. So here you have it. It is possible to create your own hand made creations without a lot of expense. This is a great way to start your stamping adventure with Clear Dollar Stamps. Last but not least is clean up. As you might have noticed in the very beginning, I used baby wipes. Non-alcoholic wipes work well, but I prefer using a stamp scrubber. Don't forget a nice cleaning solution to spray onto your scrubber. Since I added it to my stamping collection I wouldn't give it up. And finally, clear stamps can lose their cling for a variety of reasons. Sometimes, they loose cling from the very oils in our skins as we are handling them, or just from frequent use, or even a drop onto the floor where our favorite pet resides. Restoring cling is so simple - warm water and if necessary just a pinch of liquid soap. Just gently wash and let air dry. If this does not return the cling, you will need to put a little rubbing alcohol on a paper towel and wipe the back of your stamp. Make sure to rewash your stamp with soap and water to remove the alcohol. Simple as that! So that's it for my contribution to Clearly iStamp. I hope you learned something informative whether you are a new or old stamper. If you have any questions regarding Clear Dollar Stamps please ask away.